There are times when one may need to flash an Android Phone, may be due to issues or for some others, simply to try a different flavor of Android version or features provided by other Custom ROM developers. In this post, we shall see how to flash MIUI on Mi Android Phones - Recovery Update Mode. Before getting into the steps, here are some brief info which you may already be aware of. What is Stock ROM and Custom ROM? Stock ROM - refers to the Android version which is officially provided by the manufacturer company along with the device. Custom ROM - refer to the Android version that is customized and distributed by other developers. What does flashing Android phone mean? In simple words, Flashing a ROM means installing a ROM on your phone. Just like reinstalling Windows OS, flashing or installing Android OS on an Android phone can be done by keeping the user's files safe or totally clearing the user's files and settings - a complete fresh install. When do we need to flash Android Phone? May be to downgrade to an older version of ROM provided by the manufacturer. May be to try some other custom ROM by other developers for additional features, enhancements etc. Meaning by using the recovery mode provided by Mi. Complete reinstall - clean reinstall. User's files are wiped out. In this post we are discussing "How to flash MIUI on Mi Android Phones - Recovery Update Mode". For flashing in other modes , check links at the end of this post. Note: These posts are informational though the steps are safely tried by the author, the reader is advised to follow or not to follow at his or her own discretion. The author is not responsible for any issues that may arise. 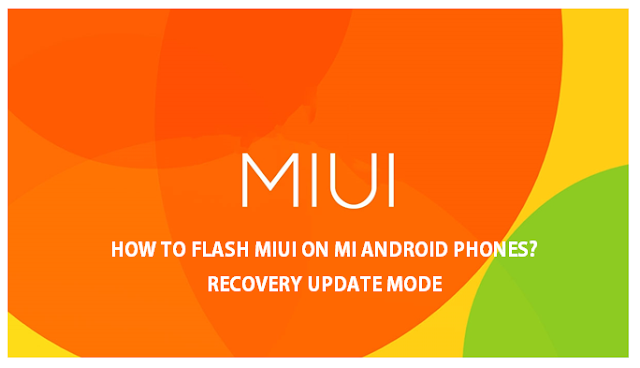 Steps how to flash Mi Android Phones via Recovery Update Mode? Note: Screenshots of examples in this post are from Mi Redmi 2 Prime. The process would be similar for other Mi phones if there are no drastic changes. 2) After the ROM is downloaded, rename the downloaded ROM file to ‘update.zip’ on the computer. 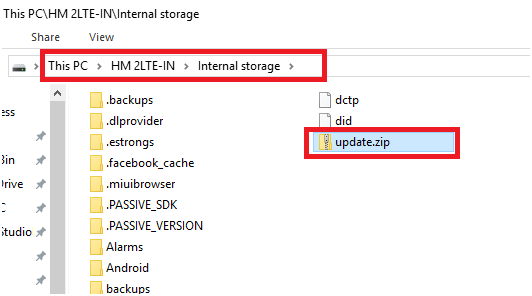 4) Copy the ROM file downloaded and renames to "update.zip" in Step 2 to the root of the internal storage of the phone. 5) Enter Recovery mode on your device. Method 1: Launch ‘Updater’ app on your device, then click the menu ‘…’ icon at the top-right corner, and select ‘Reboot to Recovery mode’. Method 2: Turn off the phone and then hold both Volume+ button and Power button at the same time to enter Recovery mode. Since the phone is already powered in, method 1 should suffice. In Recovery mode, you can use Volume +/- to navigate up or down, and Power button to confirm. After entering Recovery mode, choose the language to use. 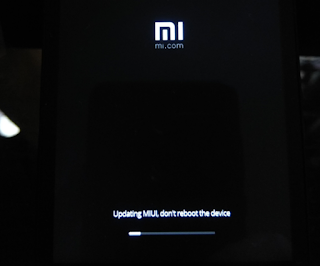 The phone will reboot and then it will display "Updating MIUI...don't reboot the device". Don't do anything with the phone. Just wait for the process to complete. After the update is over, the phone will display that the update completed. You can reboot or go back to the main menu and reboot from there. The phone will then reboot into the new Android ROM just installed. You would find that all user's files and setting are intact when flashing via recovery mode. 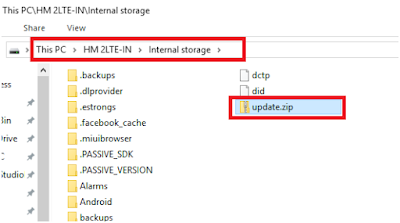 How to flash Mi Android Phones via System Update Mode? 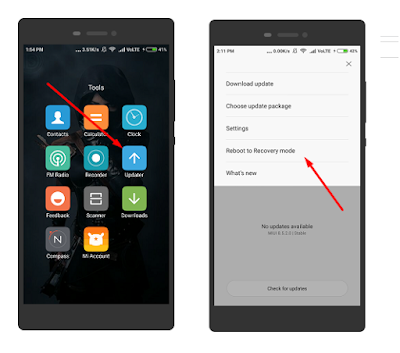 How to flash Mi Android Phones via Fastboot Update Mode?